Hello fall! 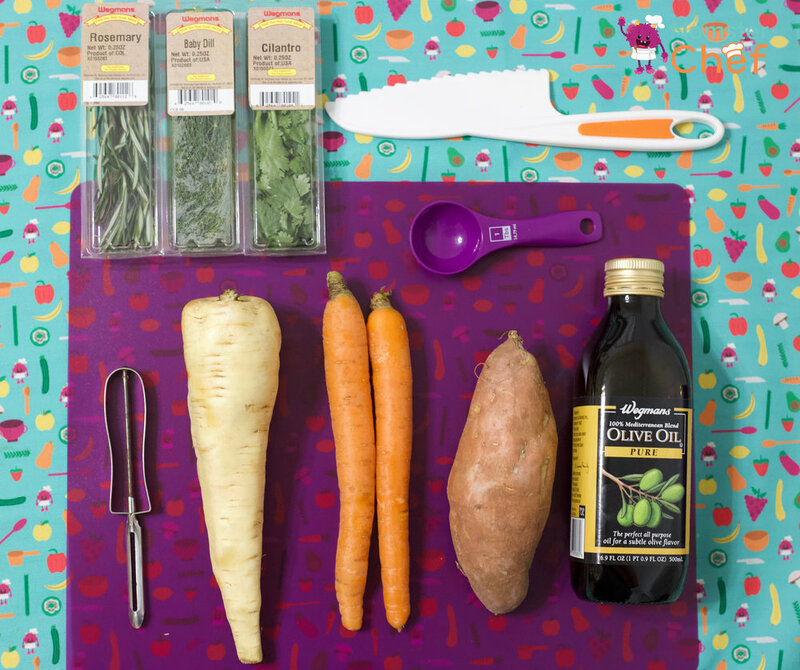 Celebrate the beginning of fall with root vegetables! 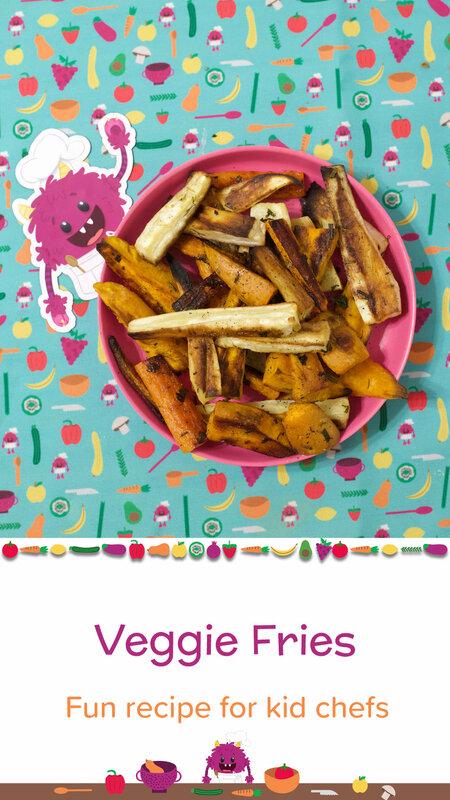 These delicious veggie fries use a variety of root vegetables to make a delicious snack. This weeks kitchen vocabulary word is peel. To peel means to remove the skin. We peel using a peeler. In this veggie fry recipe we will be peeling the vegetable skin! Use the vegetable peeler to remove the skin from the parsnip. Remember to always peel away from yourself! Use the peeler to peel the skin away from the remaining vegetables (carrots and parsnip). 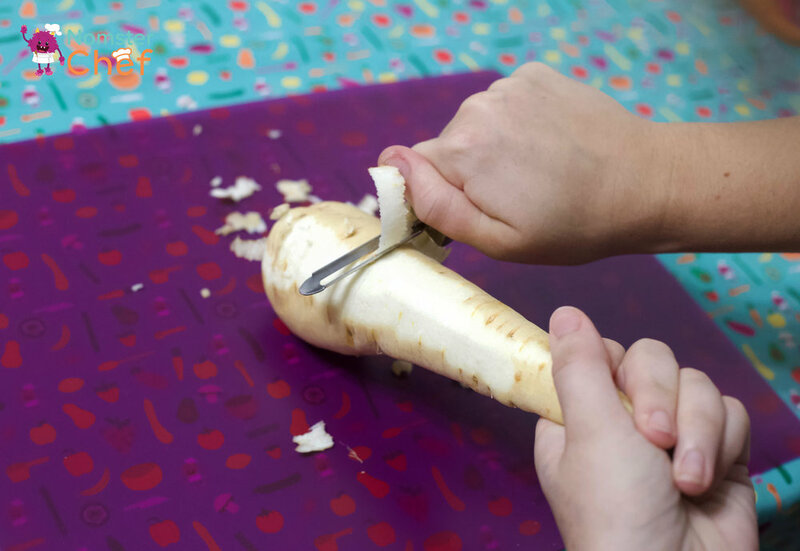 ** Grown-up step ** Once the vegetables are peeled, cut them in half lengthwise to make it easier for your kid chef to cut into wedges. Kid chef, use the kid chef knife to cut each vegetable into equal sized wedges. Set aside the vegetables in the medium sized bowl. Chop one sprig rosemary. 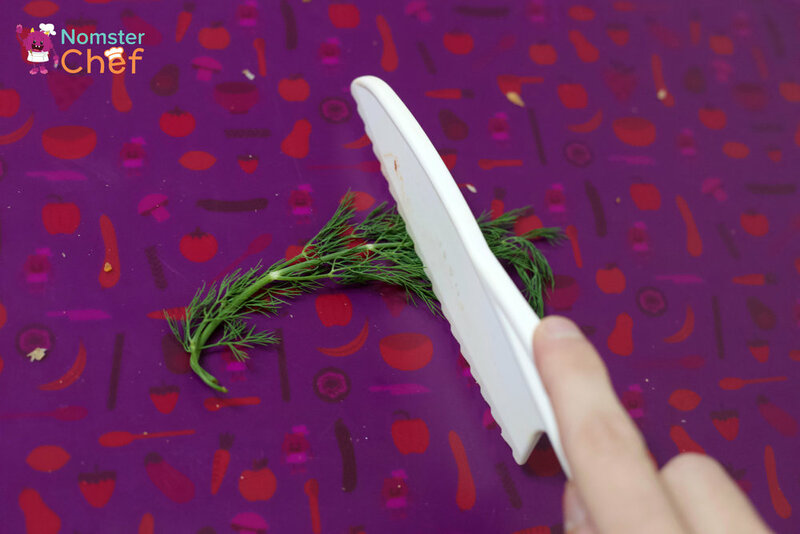 Tip: for the rosemary, hold upside down between pointer finger and thumb. Using the other hand, comb fingers through rosemary to remove the stems. (Note: grown-up might need to help with grown-up chef knife). Chop up cilantro, dill and rosemary. Remove cilantro leaves from stems and chop. Add 2 Tablespoons of olive oil to bowl with veggie fries. Next, add one Tablespoon of rosemary, dill and cilantro. With the oil and herbs added, stirr the ingredients with the vegetable wedges in the bowl. Dump about a Tablespoon of oil on the baking sheet. Use a pastry brush or paper towels to paint the oils onto the sheet. Evenly place the vegetable wedges on the baking sheet. ** Grown-up step ** Place the baking sheet in the oven. Kid, set a timer for 10 minutes. Grown-up, when the timer goes off, turn the fries over. Kid, set a timer for a second 10 minutes. Grown-up, take fries out at the end of the second timer or when they are crisp and lightly brown. Serve with your favorite condiment! Julia Tricolla is a senior communication management and design major at Ithaca College. She is the Senior Editor and Treasurer at Buzzsaw Magazine and has previously interned at 5 Star Apparel in New York City. Nomster Chef is a participant in the Amazon Services LLC Associates Program, an affiliate advertising program designed to provide a means for sites to earn advertising fees by advertising and linking to amazon.com. Clicking on these links and making a purchase earns Nomster Chef a small commission, at no additional cost to you. We are not otherwise paid or perked to recommend these products. Thanks so much for your support!